Admiring a specimen that may be older than a century. Photo by Susan Cohn. A MUSEUM OF LIVING PLANTS: THE DESERT BOTANICAL GARDEN IN PHOENIX, ARIZONA. The deserts of the world are filled with life, often unexamined by travelers rushing through what may seem to be arid wastelands. In the 1930s, a small group of Arizona citizens, interested in conserving the fragile desert environment, formed the Arizona Cactus and Native Flora Society to sponsor a botanical garden to encourage an understanding, appreciation and promotion of the uniqueness of the world’s deserts, particularly the local Sonoran Desert. In 1939 the Desert Botanical Garden opened as a non-profit museum dedicated to research, education, conservation and display of desert plants. Today, the Garden comprises 140 acres and has more than 50,000 plants in its collection, including 139 rare, threatened, or endangered species. It focuses on plants adapted to desert conditions, including an Australian collection, a Baja California collection and a South American collection. Five thematic trails wind past cacti and succulent species from around the world. Interpretive exhibits along the trails highlight desert wildflowers, conservation, desert plant adaptation and ethnobotany. 250,00 visitors each year are drawn to this one-of-a-kind showcase. 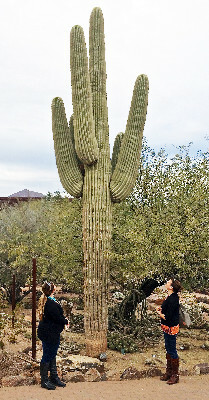 A highlight of a visit to the Garden is a close look at the saguaro cactus, the largest cactus in the United States, which may be seen on the Desert Discovery Trail. The saguaro (pronounced “sah-wah-roh”) is the icon of the American West, familiar even to those who have never been to the desert. Normally growing to be 40 feet tall and living for more than 150 years, it is native to the Sonoran Desert in Arizona, the Mexican State of Sonora, and the Whipple Mountains and Imperial County areas of California. By 95-100 years in age, a saguaro cactus can reach a height of 15-16 feet, and can start to produce its first arm. By 200 years old, the saguaro cactus has reached its full height. Whenever it rains, saguaros soak up the rainwater. The cactus will visibly expand, holding in the water. It conserves the water and slowly consumes it. The garden, which has been designated a Phoenix Point of Pride, is located at 1201 N. Galvin Parkway. It is open daily other than Thanksgiving, Christmas and July 4. Admission is free the second Tuesday or every month. Self-guided audio tours are available at the visitor center. Wheelchairs and scooters are available for rental, as are umbrellas and strollers. Dining options include Gertrude’s, serving lunch, dinner and weekend brunch, and Patio Café, with coffee, pastries, salads and sandwiches. For more information, visit dbg.org or call 480-941-1225. VISIT DESERT BOTANICAL GARDEN WITH ROAD SCHOLARS. Road Scholar, formerly known as Elderhostel, provides popular programs to Phoenix and Scottsdale that combine the usual pluses of packages tours with the advantages of travel with intellectually curious friends. Signature City Phoenix-Scottsdale includes the Desert Botanical Garden and other sights in Arizona’s Valley of the Sun. For information contact www.roadscholar.org or (800) 454-5768.